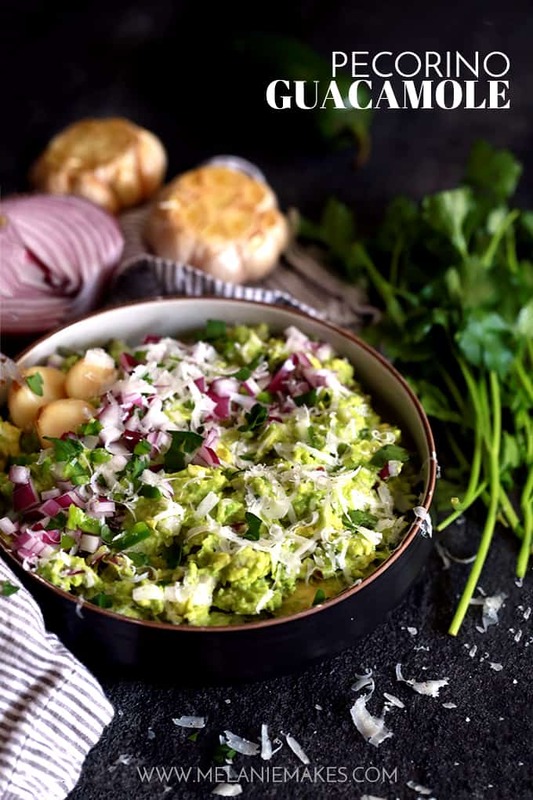 This Pecorino Guacamole begins with roasted garlic, red onion and jalapeño that are mashed with fresh avocado before being showered with Pecorino Romano cheese. This easy guacamole recipe is then seasoned with salt and pepper and garnished with additional onion, jalapeño, parsley and a drizzle of agave nectar. So I must admit I’ve become lazy in the guacamole making department as of late. I had had a string of bad luck in finding great avocados and I blame that on the reason that I started purchasing guacamole premade from Whole Foods for game day or Taco Tuesday as of late. I know, I know. I had total guacamole guilt. And then said purchased guacamole would oxidize after opening and although I knew it still tasted the same, I wouldn’t eat it based on the brownish hue it wore. But then came the magical moment where I was introduced to a way to keep my guacamole green even days later and my twist on the traditional, Pecorino Guacamole, was born. When we lived in Cleveland, there was a restaurant that served several different types of guacamole. In fact, you could order a flight of three different types of guacamole. Yes, it was as heavenly as it sounds. My Pecorino Guacamole was inspired by one of their delicious avocado concoctions. Kind of like guacamole with a bit of an Italian twist. 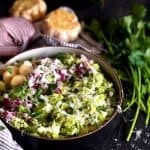 This easy guacamole recipe begins with roasted garlic, red onion and jalapeño that are mashed with fresh avocado before being showered with Pecorino Romano cheese. 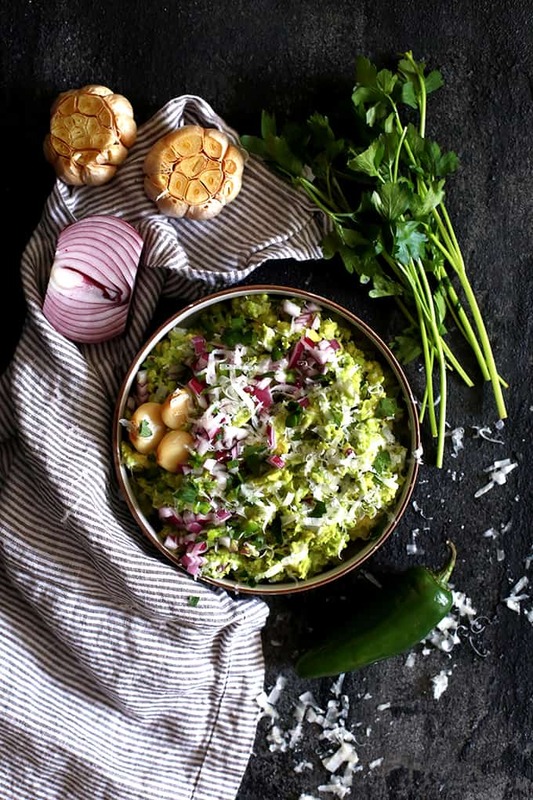 This Pecorino Guacamole is then seasoned with salt and pepper and garnished with additional onion, jalapeño and fresh parsley. The final touch? A drizzle of agave nectar over the top. The sweet, spicy, salty mixture of flavors is one that is not to be missed! I’m thinking that I could make a pretty delicious spread of my Slow Cooker Lentil and Brown Rice Tacos topped with a huge dollop of this guacamole and served alongside my Turtle Churro Nachos for dessert and a few Grapefruit Mojitos to wash it all down. If you’re down with this plan, come on over! I know what you’re thinking, though. What about all of those keeping the guacamole green promises, right? So after the party is over and you’re lucky enough to have a little bit of guac left to squirrel away in the fridge for yourself the next day, this is where you put your Casabella Guac-Lock to use. 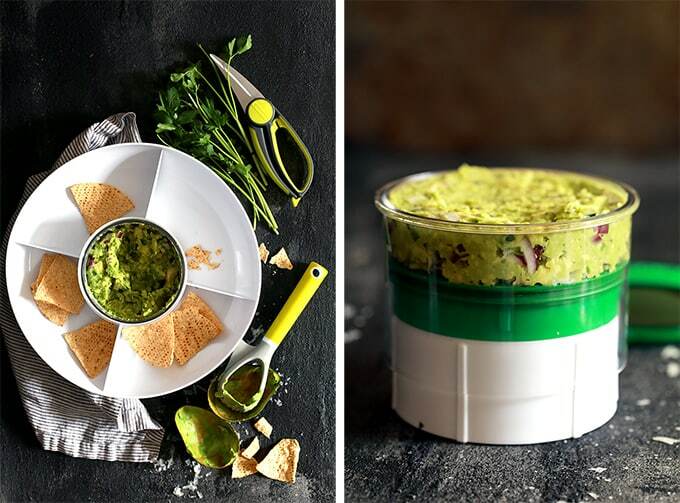 You simply fill the container with your Pecorino Guacamole and smooth, cover and lock the top and then squeeze out the air. Into the fridge it goes where it’s ready and waiting for you in all of it’s green glory. Talk about genius! This is of course after you already used both the 4 ‘N 1 Avocado Tool and Clip N Strip Shears when preparing your guacamole. These three tools basically mean I have no excuse to buying premade guac ever again! additional red onion jalapeño and chopped parsley, to garnish, if desired. Use your fingers to peel away all the loose, papery, outer layers around the head of garlic. Leave the head itself intact with all the cloves connected.? Trim about 1/4 inch off the top of the head of garlic to expose the tops of the garlic cloves and place on a shee of aluminum foil. Drizzle with 1-2 teaspoons of olive oil over each head of garlic. Wrap the garlic in aluminum foil and roast in the oven for 50 minutes.? Cut each avocado in half horizontally and remove pits. Scoop avocado flesh into medium bowl. Squeeze roasted garlic into bowl and add onion, jalapeño and cheese. Gently mash ingredients together, as guacamole should have large pieces of avocado still visible. Garnish guacamole with additional red onion, jalapeño and chopped parsley, if desired. Drizzle with agave nectar before serving. 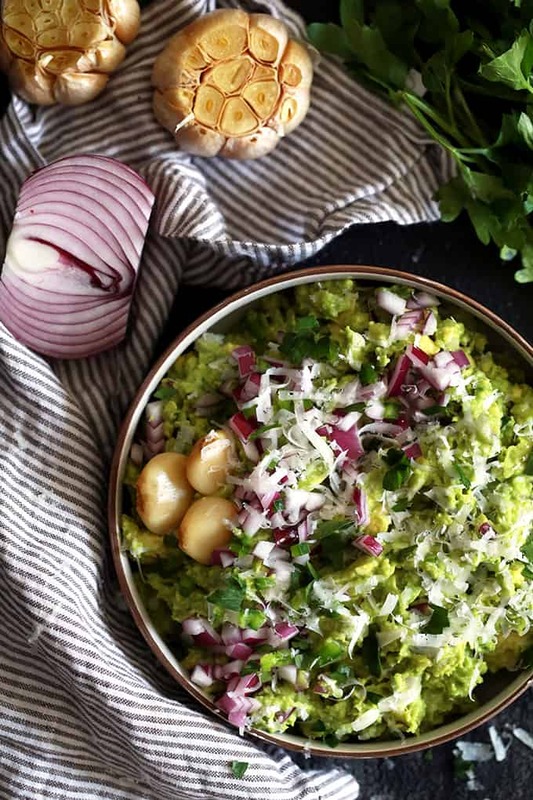 Looking for other ways to enjoy this Pecorino Guacamole? Up the flavor quotient by ditching the store bought and using it in this Easy Guacamole and Smoked Shrimp Crostini Recipe, this quick and healthy Guacamole Chicken Salad Recipe or these Easy Cucumber Guacamole Appetizer Bites. This is new for me! Love the sound of it. Great appetizer. Hope you'll give it a try and let me know what you think, Michelle! This guacamole looks so good, I'm pretty sure I'd spread it on anything! And I need to look up that nifty green keeper tool! I need that in my life! You need them both in your life, Ashlyn! I love trying new guacamole! This is definitely a new favorite, Amy! I'm intrigued! We're big guacamole fans here...I'll definitely try this one! Oh my goodness this sounds AMAZING! Definitely saving this to make! I think you'd love it, Brandy! Roasting that garlic is soooo smart! What amazing flavor! 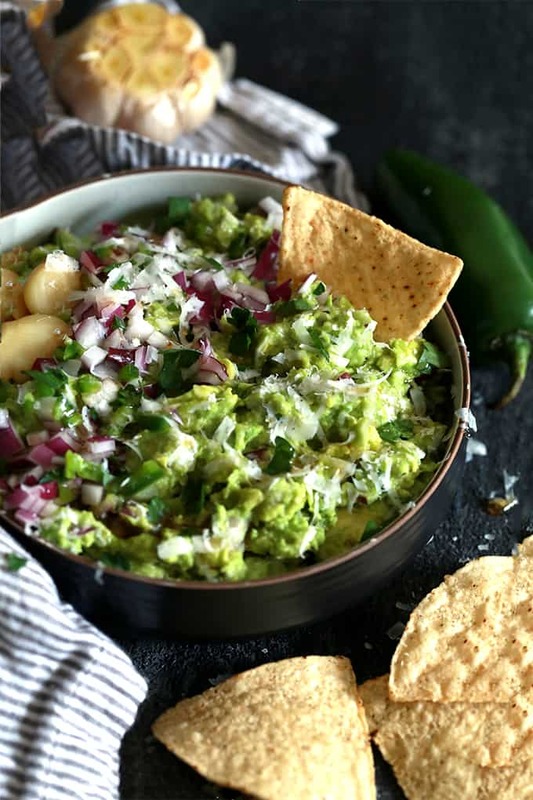 We are MAJOR guacamole fans and this looks amazing! It'll be a great way to switch things up. PS..I need that guac-lock container!! You definitely need both, Jen - the guacamole and that amazing Guac-Lock container!